Sometime during January in Kansas, we have several days of warm weather and very little wind which breaks us out of this usually cold and windy month. The “thaw” this year peaked on the 28th and 29th, achieving high temperatures of seventy-two degrees one day and seventy degrees the next. This broke an old record and tied another. Having not flown for two weeks (my last flight was only fifteen minutes in thirty-three degree temps), this nice weather’s temptation was too great to ignore. Snug in its community hangar under protective wing and fuselage dust covers, my Airbike waits for an opportunity to go flying. With “honey-do’s” for the day completed and my Tiger Moth project being on hold while waiting for a mid-construction technical inspection, I headed for the Selby Aerodrome (35KS) to do some flying! After removing the wing and fuselage covers from my AirBike and doing a pre-flight inspection, I pushed it out of the hangar. Wheels chocked, switch on, mags on; I pulled the Armstrong starter. She fired off on the first pull—only to die twenty seconds later. A second pull resulted in a “four-cycling” engine which soon settled down to the staccato noise typical of my Rotax 503. Completing the pre-flight engine check, I saluted good-bye to Don Forse who also came out to fly and then taxied to runway one-seven. It was a beautiful day, bright sun, blue sky and a direct crosswind of five to ten mph. Aileron into the wind, throttle fully advanced, my takeoff roll quickly resulted in liftoff, I separated from my shadow. 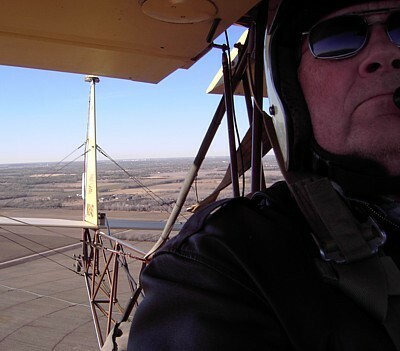 Adjusting for windage, I crabbed while climbing to 300 feet AGL anticipating a pleasant hour of flying and visiting. First stop following a fifteen minute flight, (at seventy-five mph—nice tailwind) was to Udal’s Cherokee Strip (18KS) where I visited Rick Girard while working on his Kolb. En-route I took a couple of photos while passing over the Arkansas River. This is always a pretty flight, even in winter when everything is a dull brown and there is no snow cover. There was no ice on the river, the water was low and the sand bars were huge at each of the river’s bends. The overall flight path view from three hundred feet AGL. Even in winter, it is a pretty sight displaying the Arkansas River and several of its backwater ponds. 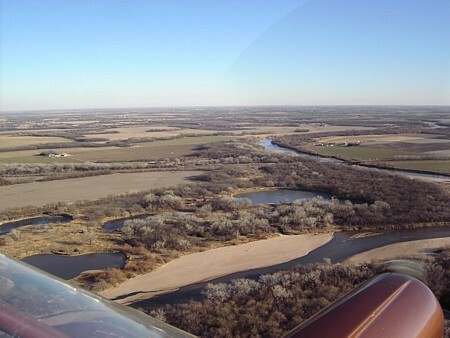 Because Kansas is quite flat, no rivers run straight, they all meander. Sometimes they form huge loops eventually creating islands where the river breaks through the narrow land bridges. Once the land bridge is breached, the river never returns to that loop. The water surrounding the island gradually silts in and dries up. The land eventually is returned to cultivation. Flying low over the sand bars, one can see ample evidence of winter life: Deer and dog tracks, tire marks from ATVs, and occasionally, human footprints. Once in awhile there are two wheel tire tracks having no obvious start or end. Could they be from a really daring ultralight pilot doing a touch-‘n-go’s on a sand bar? Or perhaps from a UFO landing there while trying to steal our women? 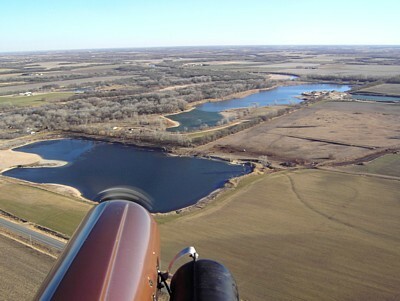 Recreational ponds for swimming, fishing and boating. 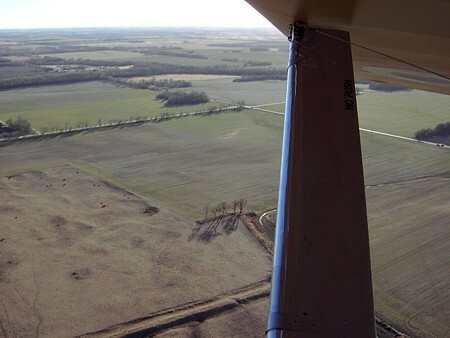 Leaving Rick’s place at Cherokee Strip, I took off in the opposite direction I landed. With the crosswind at his runway same as mine, flight direction didn’t matter. This also shortened the travel time to my next destination, Pilot Pointe (pvt) ten minutes away. My low pass over that runway let folks know that AirBike Ace was out securing the territory and protecting women and children. Next fly-by was Alley Field in Douglass, better know as the “Alaskan Bush Country” runway because it is on a steep hill. Its grade is much more than an “incline.” I made two passes and observed that “the lights were on but no one was home.” Time for me to go home. Squinting into the sun, I fly home. The setting sun shone directly into my eyes making looking into it not only difficult but painful. Casting my gaze sideways and down, I noted familiar terrain while flying in the direction of Selby Aerodrome. At 5800 RPM my ground speed was fifty-six MPH into that previously useful tailwind, now an obstinate headwind. In twenty minutes I entered Selby’s pattern. One hour and three practice landings later I had filled my fun-quotient for the day and taxied to the hangar. The low slanting sun's rays highlighted the slight twinge of green created by last fall's planted winter wheat. A definite clue that winter is waning. One of the resident hangar landing judges, Bill Bailey (a.k.a. “Avenger”), was sitting at the picnic table when I stopped at the hangar door’s concrete apron. With the engine shut off, I could hear him say: “Two out of three Paul, not bad but I had expected better from you.” Bill can be quite critical at times, hell, nothing broke or fell off the plane during landing. Wasn’t that good enough? Nice story, Ace! It’s got me hankerin’ for a flight this weekend. The forecast is for a high around 60º on Saturday. For me, though, the determiner isn’t as much the temperature as it is the field condition. With my propeller being behind the landing gear, I won’t risk slinging mud into it on takeoff if it is too wet out there. I’ll probably come out and check the condition of the field anyway.